One critic, who was kind enough to look at this book in manuscript, recommended me to abandon the design of Publishing it, on the ground that my logic was too like all other logics; another suggested to me to cut out a considerable amount of new matter. The latter advice I have followed; the former has encouraged me to hope that I shall not be considered guilty of wanton innovation. The few novelties which I have ventured to retain will, I trust, be regarded as legitimate extensions of received lines of teaching. My object has been to produce a work which should be as thoroughly representative of the present state of the logic of the Oxford Schools as any of the text-books of the past. The qualities which I have aimed at before all others have been clearness and consistency. For the task which I have taken upon myself I may claim one qualification—that of experience; since more than seventeen years have now elapsed since I took my first pupil in logic for the Honour School of Moderations, and during that time I have been pretty continuously engaged in studying and teaching the subject. In acknowledging my obligations to previous writers I must begin with Archbishop Whately, whose writings first gave me an interest in the subject. The works of Mill and Hamilton have of course been freely drawn upon. I have not followed either of those two great writers exclusively, but have endeavoured to assimilate what seemed best in both. To Professor Fowler I am under a special debt. I had not the privilege of personal teaching from him in logic,—as I had in some other subjects; but his book fell into my hands at an early period in my mental training, and was so thoroughly studied as to have become a permanent part of the furniture of my mind. Much the same may be said of my relation to the late Professor Jevons's Elementary Lessons in Logic. Two other books, which I feel bound to mention with special emphasis, are Hansel's edition of Aldrich and McCosh's Laws of Discursive Thought. 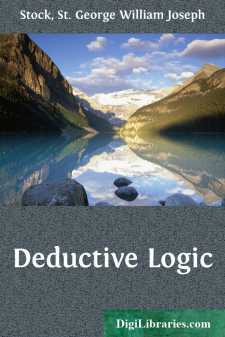 If there be added to the foregoing Watts's Logic, Thomson's Outlines of the Laws of Thought, Bain's Deductive Logic, Jevons's Studies in Deductive Logic and Principles of Science, Bradley's Principles of Logic, Abbott's Elements of Logic, Walker's edition of Murray, Ray's Text-book of Deductive Logic, and Weatherley's Rudiments of Logic, I think the list will be exhausted of modern works from which I am conscious of having borrowed. But, not to forget the sun, while thanking the manufacturers of lamps and candles, I should add that I have studied the works of Aristotle according to the measure of my time and ability. This work has had the great advantage of having been revised, while still in manuscript, by Mr. Alfred Robinson, Fellow of New College, to whom I cannot sufficiently express my obligation. I have availed myself to the full of the series of criticisms which he was kind enough to send me. As some additions have been made since then, he cannot be held in anyway responsible for the faults which less kindly critics may detect. For the examples at the end I am mainly indebted to others, and to a large extent to my ingenious friend, the Rev. W. J. Priest of Merton College. My thanks are due also to my friend and former pupil, Mr. Gilbert Grindle, Scholar of Corpus, who has been at the pains to compose an index, and to revise the proofs as they passed through the press.